I’m sure I speak for the vast majority when I say this, but nothing makes me quite as happy as the sun. After seemingly weeks of rain, the forecast in Vancouver is finally calling for warm sunshine… and wearing a bright orange sweater tank / matching lip combo in honour of that seems ideal. Have a great Monday! Loving the new hair, Jen! So cute on you! And I was just looking at that very lip color this weekend – I didn’t end up buying but might go back for it! I really like the Revlon Lip Butters overall! Your hair is getting so long! It’s beautiful! Such a pretty outfit! I went through a phase of wearing a mango/tangerine lipstick – I think you have reminded me of it and now I cannot wait to wear it again! Love the colour of the tank top on you. Such a beautiful post. Thank you. Such a cute outfit. I love the orange and blue colour combination on you! 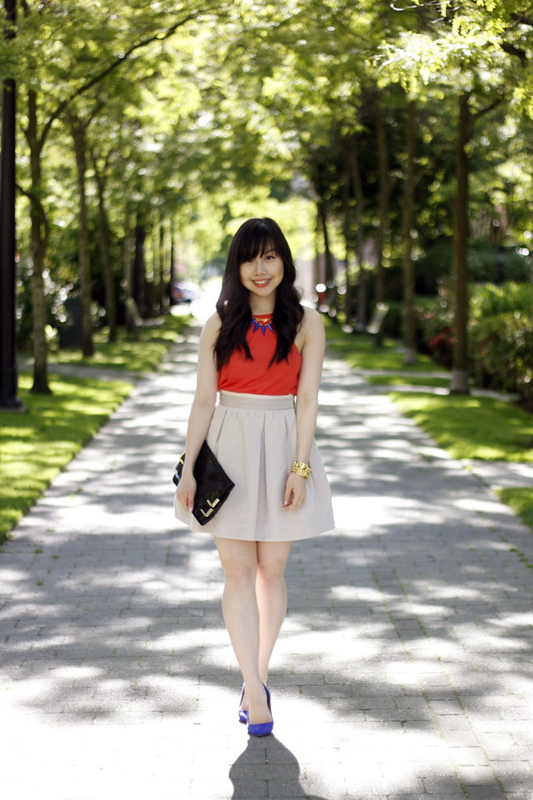 I absolutely love the silhouette of your skirt and how well it works with your bright top! Cute outfit. Great color combo. Love the skirt, this look is amazing! Love the mix of the red and blue together!